Today began with more of Dana’s presentation “How Nature Works.” He emphasized the way that fire serves to maintain nature’s balance. This is a salient issue because the recent wildfires in Washington burned close by but were stopped before reaching downtown Winthrop. 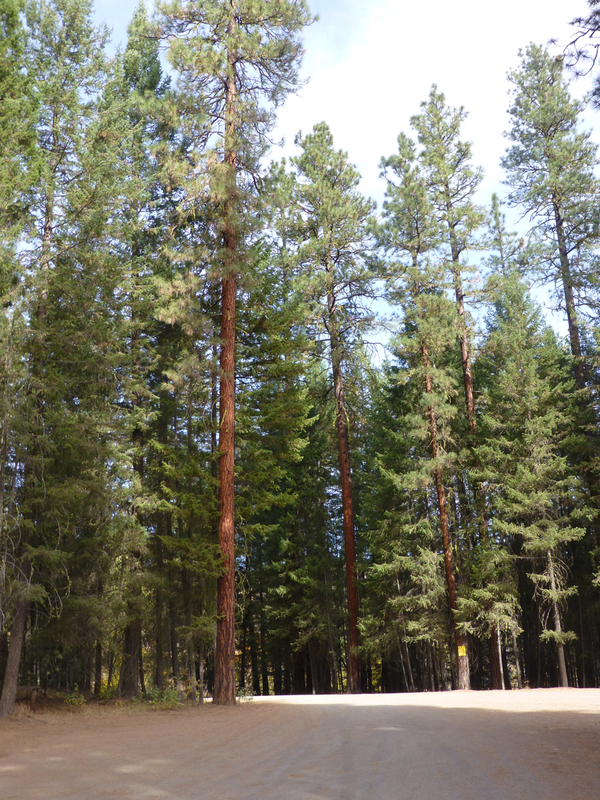 According to Dana, Ponderosa pines have developed thick bark that protects them from fire. Brush fires burn quickly, and when they sweep through a forested area, they are gone before they can burn through the bark of a Ponderosa pine and harm the interior, living part of the tree. These fires burn low-lying vegetation that competes with trees for nutrients from the soil. When allowed to burn freely, these fires keep down the growth of vegetation on the forest floor. But when the fires are routinely extinguished, low vegetation builds up so that, when a fire does arise, there is plenty of fuel for it to burn through. This is why the recent fires were able to spread across the area so quickly. Dana also took us to the nearby beaver pond. Despite the name, beavers no longer live there because the owners of the land now trap and relocate them when they show up. The reason, Dana told us, is that beavers would cut down all the aspens that surround the pond within about 10 years. Although we didn’t get to see beavers, we did see both ducks and geese swimming on the pond. The second part of today’s program was the introduction of “Northwest History in Story and Song” presented by Hank, a singer, historian, and storyteller. Hank discussed the European exploration of the Pacific Northwest. He punctuated his slide presentation with songs that capture the spirit of the people who manned the ships that came looking for the Northwest Passage. Such songs represent the oral history tradition that prevailed before most people could read and write. On the ships, the shantyman sang songs that provided the rhythm necessary for whatever job the men were performing: The more rapid the action, the more lively the song. Since our move to Washington State, we’ve done most of our exploring along the coast, between northern Washington and San Francisco. Now that summer is over, we decided to head east over the Cascade Mountains. This is not a trip for summer, as the temperatures east of the Cascades are often in the 90s, sometimes even more than 100. 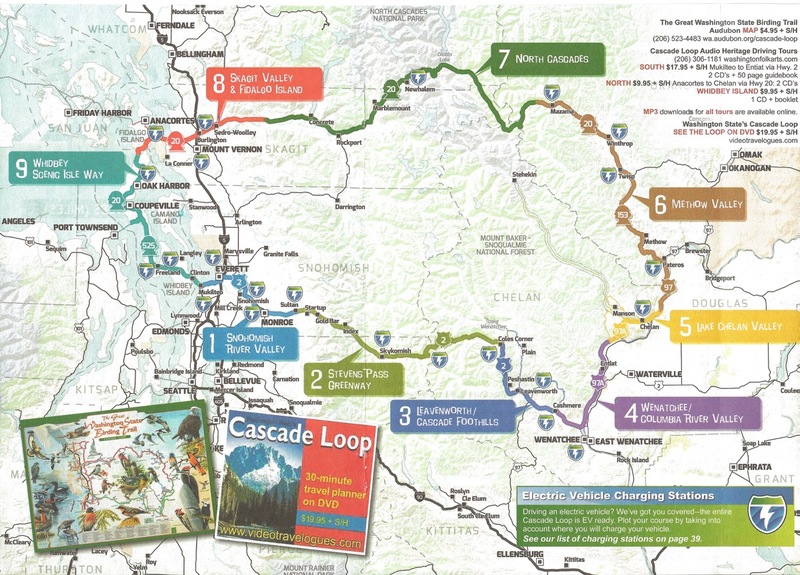 We signed up for the Road Scholar (formerly ElderHostel) class called Nature at Work in the North Cascades, Northwest History in Story and Song, and Life in Methow Valley. We decided we’d take the northern route out today and the southern route on our way back home. Highway 20 goes through the North Cascades in an area often referred to as the North American Alps. You can see the pointed, rocky mountaintop typical of this area in the photo at the top of this post. Our destination was Sun Mountain Lodge, a resort on 3,000 acres with miles of hiking trails, on the outskirts of Winthrop, Washington. 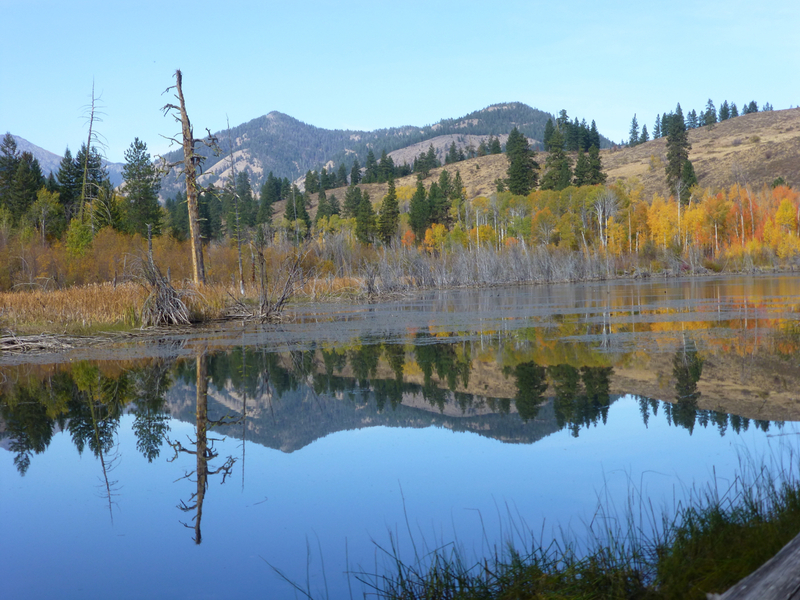 This area is known as the Methow Valley. Methow is pronounced MET-how. The river and its surrounding valley take their name from the Native Americans who originally traveled the land fishing, hunting, and gathering wild foods such as berries and roots. The program began in mid-afternoon with a lecture entitled “How Nature Works” by Dana, a local botanist. His focus was on how plants convert energy from the sun into food. After his talk he lead us on a nature walk on one of the trails closest to the lodge. He showed us how to use a botanist’s loupe (small magnifying glass) to look closely at flowers, leaves, and seeds. My big discovery on this walk was quaking aspens, which I had never seen and heard before. Or at least I’m not aware of having seen them before. According to my book about plants of the Pacific Northwest, aspens cover New England, where I grew up, but I don’t remember them. Perhaps I lived in an area that wasn’t high enough for them. Because aspens like cool weather, they are usually found at elevations between 5,000 and 12,000 feet (1,500–3,700 m). The flat leaves of these aspen trees, Populus tremuloides, shake or quiver in the slightest breeze in an effort to take in as much carbon dioxide and to expel as much oxygen as possible. This behavior has given the trees the name quaking or trembling aspens.